Are the US Elites Attempting to Destroy Europe by Triggering A Flood of Immigrants and Refugees? A side effect of the American neocon strategy of up-ending the Middle East is to flood Europe, and in particular, Germany, the continent’s dominant power, with non-Christian immigrants. The author argues that this is deliberate, and that Merkel and Obama are neocon patsies, leading Europe to destruction, and that Russia is one of the few countries whose leadership understands what is happening, and is fighting back. A few years ago, views like these would be considered on the fringe. Today they are going mainstream. Witness the popularity of Donald Trump. From the United States to Europe, the Western elite are allowing a massive influx of foreigners to enter their lands, radically transforming the face of Western societies in a bid to divide, conquer and expand their military and financial rule across an unsuspecting planet. Angela Merkel was even named Time’s “Person of the Year” for spearheading the influx which threatens to tear Europe apart. Today, Merkel is humming a completely different tune as a wave of refugees storms Europe from all corners. Trusting the public’s short memory span, the German leader has put out the welcome mat along her country’s lengthy border, telling the world Germany is ready to accept over 1 million new arrivals – and on practically the same day that 130 people were killed by alleged Islamic fundamentalists around Paris. Part of the public’s change of heart towards the plight of refugees came from the tragic story of Aylan Kurdis, the Syrian child whose body was found washed up along a shoreline in Turkey after the boat he had been traveling in capsized. Of course, the corporate-owned, super-consolidated media, never one to ignore a tragic moment (and especially one with graphic photographs) posted the story on every newspaper frontpage across Europe. Indeed, these were the same Western newspapers that ignored the depravations brought to children around the Middle East from NATO attacks on sovereign countries like Afghanistan, Iraq, Libya and now in Syria. One need only read the subtitle that accompanied The Sun’s front page headline, which said: « Bomb Syria for Aylan. » Talk about using tragedy to sell the ugliest agenda of them all: War. 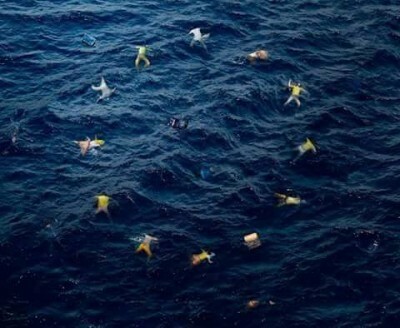 So while the European people are being coerced by a relentless media campaign to accept Syrian refugees or be labeled neo-fascists (a word few Germans can tolerate following the harrowing memory of Nazi Germany, a memory the media will never let the German people live down), the refugees are being magnetically drawn to Europe by the promise of easy money and easy jobs. Note: it has been proven that most of the new arrivals to Europe are not from Syria, but rather from other war-torn places, like Afghanistan, Iraq and Libya. Refugees in Germany receive up to 345 euro per month from the government, whereas in Sweden the monthly allowance is up to 224 euro. Compared to the places and situations where the refugees are escaping from, this temptation of free money is practically impossible to ignore. The PNAC identified five nations it deems as « deeply hostile to America » – North Korea, Iraq, Iran, Libya and Syria (former US General Wesley Clark added another three to that list a bit later: Lebanon, Somalia and Sudan). It should come as no surprise that two of these five countries have already suffered a US-led occupation/capitulation, while Syria is still managing to survive, albeit only due to the military intervention of Russia. There is the temptation to point to the colorful life story of Barack Hussein Obama – America’s first black president of Kenyan descent who is known to hold strong opinions on the way minorities have been treated present and past – as a powerful reason for national borders collapsing around the world, and most shockingly in the United States and the European Union. Indeed, the real estate tycoon Donald Trump has practically sealed his nomination for the Republican presidential candidacy on nothing more than the promise to build a « gigantic wall » separating America and Mexico. So why doesn’t Obama make an equally simple promise and shut down the Trump threat once and for all? Although I do believe that Obama is predisposed by both his skin color and life history to show sympathy to the plight of refugees and minorities, and is thereby less inclined to shut down America’s borders, I don’t think the US president’s race can explain everything (although it has a wonderful way of scaring off any would-be critics out of fear of being branded ‘racist’). The simple fact is that Obama is reading from a script that was written many years ago. Washington is simply weighed down by too many powerful, behind-the-scenes puppet masters for anything to happen by chance in the realm of US politics. We would be amiss to singularly blame Obama for destroying the once proud European civilization (now hanging by a thread in a few stubborn holdouts, like Russia, Hungary and Belorussia). The blame must be placed on the very malevolent system that every American leader is forced to either accept or fight once in the Oval Office (John F. Kennedy is perhaps the best proof as to what will happen to any US leader who attempts to be his own man and demand real change. We can no longer allow ourselves to be deluded as to what is really happening in the world today. The United States is actively and intentionally destroying the old fabric of nationality – the very glue that holds together cultures and civilizations – around the world, and it does not matter if the state is friend or foe, Christian or Muslim, rich or poor. This is much easier achieved if people no longer have anything remotely in common with their neighbors. The microcosm of this demonic system is already playing out on Main Street, USA, where local police forces are actually receiving military-grade weapons to use against the American people – while our national borders remain open to killers, rapists and drug traffickers from South America (!). In Europe, the very same tragedy is playing out like a cold-blooded murder in broad daylight. Thanks to America’s reckless foreign policy agenda, which went absolutely insane following the terrorist attacks of 9/11, NATO countries are being helplessly dragged into battles and regardless of the public outcry and protests against these illegal wars, which have already happened in Iraq, Afghanistan, Libya, and now Syria – all of which have resulted – or soon will result – in failed states. But the real failed states will eventually be the old colonial powers of Europe, which sit on the front line of the refugee tsunami provoked by the US that is now crashing across the region, threatening to engulf every city from Lisbon to Helsinki. This development only plays further into Washington’s hands as the European people – increasingly terrified by pre-planned acts of war, terrorism and financial collapse – look to a savior to rescue them. At that point, they will walk happily and blindly into captivity like lambs on the way to slaughter, believing they are free until the moment of their destruction. In other words, when it is too late to reverse their fate and the real face of the global tyrant is revealed.